All three of my hobbies are contained in this episode of Carl & Jerry - electronics, astronomy, and airplanes! For as clever as the two teenagers are, they sure do manage to get themselves into some sticky situations due to what can only be termed as stupidity. This is not the first time their future relied on a fairly large number of people being 'out there' who were familiar with Morse code. Supporting the claim that trends run in cycles, the ignition-type model engine common in the mid 1950s eventually gave way to glow fuel (a nitro methane and castor or synthetic oil mix) engines, but nowadays miniature electronic ignition systems have made model-size gasoline powerplants popular again, especially given the 5x cost of glow fuel compared to gasoline. I'd be giving up the story's plot by telling you what happened, so you'll want to read this yourself. Enjoy! Man, did you ever see a sweeter flying job?" Carl demanded enthusiastically, as he and his chum, Jerry, squinted at Carl's radio-controlled model plane sailing along against the late afternoon January sky. "Surely does handle well," Jerry agreed, doing a little jig on the frozen ground to keep warm. It had been a fine winter day with the temperature up in the 40's, but now the mercury was sinking with the sun. The boys were flying their model in a large field just beyond the outskirts of town. At the other end of the field were the ruins of a box factory that had been completely destroyed by fire several years before. Only a tall brick chimney had been left standing. "Better bring it in for a landing," Jerry suggested. "It's getting late, and I think I can smell snow in the air." "Okey-dokey," Carl agreed; "but get a load of this tight turn around that smokestack." As he said this, he stuck his finger in the opening marked "L. Trn." of the telephone dial mounted on the transmitter control box; pulled it down against the stop and released it. Instantly the little plane banked gracefully and turned toward the top of the smokestack. "Hey!" yelled Jerry, whose depth perception was much better than Carl's, "you've turned too quick!" By the time he got the warning out, however, and in spite of all the "body English" he tried to put on the little plane, it closed the gap between it and the smokestack - and failed to appear on the other side. At the same instant, the steady snarl of the little motor ceased abruptly. "Holy cow!" Carl groaned, "it's crashed!" He set the control box on the ground and started at a dead run across the field. Jerry followed, but Carl's long legs and athletic build gave him such an advantage that by the time his chubby companion came puffing up to the base of the chimney Carl had loped around it twice. "Hey, that's funny," Carl muttered. "I can't see a thing of it, and there's no .place for it to hide, unless -" As though worked by a common string, the heads of both boys tilted back as they stared up at the top of the chimney towering some sixty or seventy feet above them. "That's where it went," Jerry said with conviction. "It was just skimming the top, and I thought it might clear; but it must have dived right into the top. Well, scratch one model plane." "That's what you think," Carl said determinedly, reaching for a rung of the wide ladder going up the side of the chimney. "I've got at least a gallon of sweat and several acres of lawn mowing invested in that gas motor and the plane controls, and I intend to get 'em back or know the reason why." "All right," Jerry said resignedly, as he started up the ladder behind his friend; "I'm just stupid enough to go along with you." In a few minutes, the boys were standing side by side on an upper rung of the ladder while they leaned over the broad lip of the smokestack opening and stared down its throat. Even at the narrowed top, the stack measured a good eight feet across. "Heck," Carl said in disappointment: "it's too dark down there to see a thing." "Hold your horses a minute," Jerry grunted, as he squirmed around on his stomach so that he could reach into a pocket and pull out the flashlight case that contained the booster-battery used in starting the plane motor. He unscrewed the adapter with its two flexible leads from the bulb socket, screwed the bulb back in place, and replaced the lens cap. When the restored flashlight was shone down into the chimney, the white cross formed by the wing and fuselage of the plane could be faintly seen at the bottom. "You hold the flashlight. I'm going down and get it," Carl announced. "Oh; no, you don't," Jerry exclaimed, as he threw a fat leg over the edge of the stack and reached for the top rung of the rusty narrow iron ladder that went down the inside of the chimney. "This is my chance to check up on that old business about whether or not you can see stars in daytime from the bottom of a well or chimney, and I'm not going to muff it. You can tag along if you want to." Cautiously, the two boys went down the rust-eaten ladder. 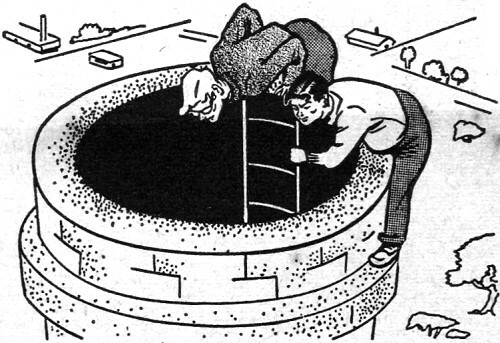 All went well until they were about ten feet from the bottom, and then suddenly the whole lower section of the ladder gave way under their combined weight and they dropped to the bottom of the chimney. Jerry fell on his back on the layer of soft ashes at the bottom of the chimney, and Carl came down on top of him. The section of ladder broke into several pieces and clattered harmlessly around them. Carl quickly sprang to his feet and looked anxiously down at his friend still lying on his back and staring intently up at the little circle of blue far above them. "Are you hurt, Jerry? Can't you get up?" "You can see stars, and they're all different colors," Jerry observed softly, in a bemused voice. "Come on; snap out of it," Carl said, unceremoniously yanking Jerry to his feet. "You don't need to go down a chimney to see the kind of stars you're seeing. Hey! Did you have to land squarely on top of my plane?" "There's just no pleasing some people," Jerry sighed, as he lifted the flattened model from where he had been lying and shook the ashes from it. "Here I break your fall with my very own body, and all you do is gripe about your darn plane. I think we're mighty fortunate. If that ladder had broken loose a little farther up, we'd both have been killed; and it would have been our own stupid fault. Trusting that rickety old iron ladder was not one of our brighter acts." "You can say that again," Carl agreed, as he stared owlishly about him in the dim light that filtered down from above; "but now the $64,000 question is: how are we going to get out of here? There's nothing to climb on to reach the bottom end of that ladder, and I wouldn't want to trust it again if we could reach it. These chimney walls are too thick to chisel through even if we had tools. The one opening through the wall, that one up there near the bottom end of the ladder where the smoke from the boilers came in, is sealed off solidly with heavy metal plates that sagged down over it when the box factory burned. I've noticed that before from the outside." "If you were Tarzan, you might go hand over hand up this little cable that runs along the side of the chimney," Jerry observed. "What's it for, anyway?" "It's a ground lead for the lightning rods on the top," Carl said; "but I'm not Tarzan, and I wouldn't want to trust my weight on it if I were. No, I'm beginning to think we'll never get out of here without help. We've got to cook up some way to let people know we're in here." "A fat lot of good that'll do. We never saw a soul around here all afternoon; and now that it's getting dark, no one will be around for sure." "We might build a fire. Then when people saw the smoke, they'd come to investigate." "A dandy idea if we had something to burn, if people could see smoke in the dark, and if we didn't suffocate long before anyone no­ticed the imaginary smoke." "Okay, smarty; you make some suggestions and let me knock them in the head for a while." "Let's see what we've got in our pockets. Maybe that will give us an idea. All I've got in mine is a cigarette lighter, a dime, a quarter, and this little piece of wire." "This thing makes a spark for the motor, and will make a spark for a transmitter." "I can do better than that," Jerry boasted. "I've got this flashlight and the booster-battery adapter. Here's a small file I brought along to dress that nick out of the propeller blade. Finally, here's one slightly squashed chocolate bar that was in my hip pocket. We had better cut that up in small portions and eat just a little bit each day to keep up our strength." "That's out," Carl said flatly. "If we don't get out of here pretty soon, we'll freeze to death anyway; so let's break that in two and eat it right away. Maybe it will help us think. All I can think of right now is that Mom is having spaghetti and meatballs for supper tonight, and there's going to be an empty chair at the supper table." For a little while, the two friends munched their chocolate in silence. Finally Jerry said slowly: "What we really need is some way to send out a call for help. If you had just brought that control transmitter with you, we might have been able to rig up some sort of low-frequency transmitter with the parts, but we surely can't build a transmitter with what we've got here. We don't even have a tube." "They had transmitters before there were tubes," Carl pointed out. "Don't forget the old spark coil jobs. But that doesn't help either because we don't have any spark coil -"
He broke off abruptly. as Jerry leaped to his feet and snatched the broken model plane from the ground. "Who says we don't?" Jerry gloated, starting to remove the tiny induction coil from the fuselage. "This thing makes a spark for the motor, and it will make a spark for a transmitter." "This I gotta see," Carl said dubiously. "You've got to have either a.c. or rapidly pulsating d.c. in the primary of that coil to get a continuous spark discharge across the secondary. Where are you going to get that?" "Fire up that lighter of yours, and just watch and see," Jerry said, as he busied himself with the coil and the booster-battery adapter for the flashlight. In a few minutes, Jerry had a haywire arrangement of wires, flashlight case, and induction coil spread out on the ashy floor. Two bits of the wire from Carl's pocket had .been used to form a small spark gap across the secondary of the induction coil. One terminal of the flashlight battery was connected to one end of the induction coil primary, but leads from the other side of the battery and the other side of the primary were left free. At Jerry's direction, Carl used the rest of the wire to connect one side of the spark gap to the lightning arrester cable. The other side he stuck in the ground several feet away. Finally, Jerry connected one of the loose primary wires to the blade of the file and pressed the end of the other wire against Carl's quarter. When the quarter was drawn rapidly across the serrations of the file, the rapid making and breaking of the primary circuit of the induction coil produced a ragged blue spark discharge across the small gap. "It works!" Jerry exclaimed. "What shall I say? Had we better start out with SOS or use the amateur emergency call, QRR?" "Better use SOS," Carl advised as the lighter flickered out. "More people are familiar with that. Then go ahead and say something like, 'Please send help to the old box factory chimney. We are imprisoned within it and -' "
"All right, Charles Dickens; cut it short," Jerry interrupted. "This quarter-and-file keying arrangement is not exactly a bug, you know. I'm going to send 'SOS box factory stack' over and over and let 'em take it from there." With this, he started drawing the coin across the file in short and long strokes to form the respective dots and dashes. "Z-z, z-z, z-z; z-z-z-z-z, z-z-z-z-z, z-z-z-z-z; z-z, z-z, z-z," hissed the little spark, and its light cast a flashing, eerie, blue glow on the intent faces of the two boys. 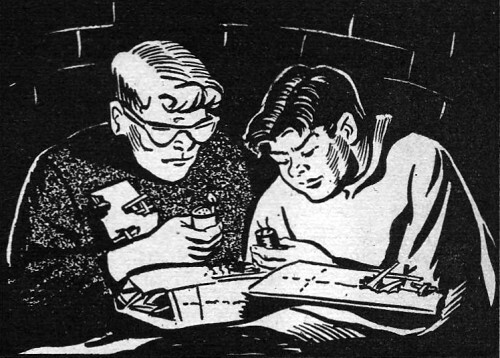 By now it was almost completely dark inside the chimney, and Jerry "keyed" the transmitter entirely by sense of touch. Needless to say, the sending was not exactly machine-like. After a quarter of an hour or so, the batteries grew so weak that the spark would no longer jump the gap. The bits of wire were pushed closer together and the message repeated until even this smaller gap was too much for the failing batteries. "That's it, I guess," Jerry announced. "After resting a few hours, the batteries will recover enough to let us make one more short transmission; we'll save that for daylight." "What frequency do you suppose we're sending on?" "Just about all frequencies. A spark gap emits a very broad band of frequencies, and there are no tuned circuits in this rig to peak it up." "Well," Carl said disconsolately, "it looks like nobody heard it anyway -"
Faintly, but unmistakably, there came the sound of a wailing police siren. It came closer and closer and then stopped abruptly. A few minutes later, the boys heard muffled voices outside the chimney. "Help! Help! Here in the chimney!" they shouted in unison. Seconds later, a strong spotlight was shone into their upturned faces from the top of the chimney, and a dangling rope was let down to them. By means of this rope, the boys were hoisted up one at a time until they could reach the bottom end of the broken ladder, and then were helped on up and out of the chimney. "I might know it would be you two," the police sergeant said coldly, as he surveyed the begrimed but happy boys. "Every time something weird happens in this town, you jokers are mixed up in it." "Who picked up our message?" Jerry asked eagerly. "Who didn't!" the sergeant growled. "For the past half hour they've been ringing the police station phone off the wall. 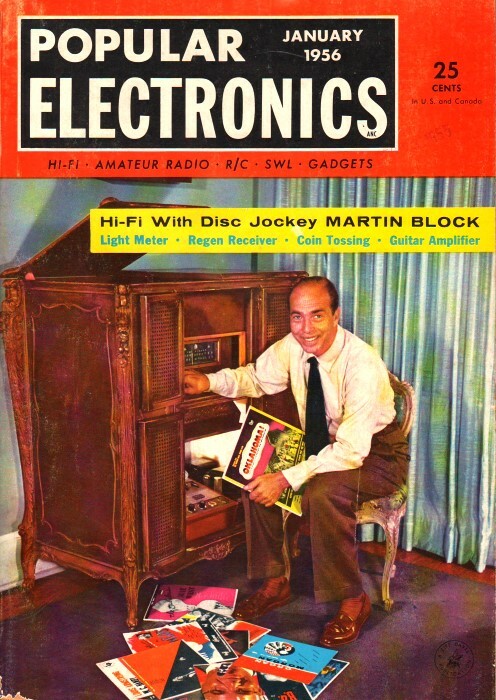 A few of the calls were from hams, Boy Scouts, and ex-Army or -Navy operators who actually picked up the message on the broadcast or short-wave bands; but dozens of calls were from irate TV viewers who were just plain mad because someone was clobbering Milton Berle on their sets - and on the very night when Marilyn Monroe was a guest star, too. Right now, you two are probably the most hated pair in this whole town!"